Homebuilding stocks have been steadily hammered (forgive the pun) in 2018, as a combination of steadily rising interest rates and weakening national home sales numbers has Mr. Market convinced that more bad days are ahead. And while housing continues to prove a painfully cyclical business, there continue to be some bright spots in the industry, particularly for the builders taking advantage of a continued shortage of entry-level housing. That's certainly been the case for Meritage Homes Corp. (NYSE:MTH), which reported its third-quarter results late on Oct. 24. 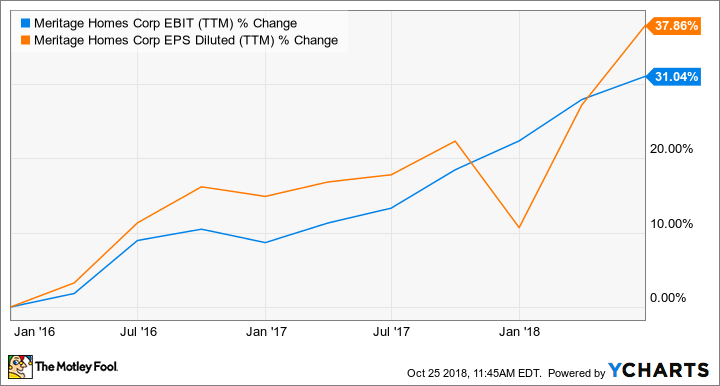 Once again, Meritage delivered solid results, with home closing revenue up 9% in the quarter, roughly on par with its 10% gains so far this year, while earnings surged 30% per share. While lower corporate tax rates are helping boost the company's -- along with every other homebuilder's -- earnings, it also reported a solid 13% jump in pretax profits on higher gross margins and relatively steady expenses as a percentage of sales. But two things bear watching closely: a shrinking order backlog and a growing inventory of new land to develop even as the housing market continues to tighten. Let's take a closer look at the results and what management had to say. Meritage Homes has made entry-level housing its priority for the past several years, and this strategy has paid off well over the past couple of years. As noted above, revenues and earnings are up big, and gross margins have actually improved, even as the company has steadily built more lower-cost homes. Home closing gross margin was once again more than 18%, coming in at 18.4% when adjusted for a one-time expense to terminate a land purchase agreement from prior to its entry-level strategy. The company also continues to leverage its operating scale relatively well. SG&A -- selling, general, and administrative -- expense came in at 11% of sales, in line with the year-over-year quarter. Both metrics were also in line with the second-quarter result as well. The thing that's been interesting to see with Meritage's results is that its gross margins have steadily crept higher over the past 18 months, even as its average selling price has steadily fallen. This is an intentional occurrence, however, as management has prioritized developing entry-level properties -- about 80% of its land purchases over the past several years will be developed into starter homes -- and generally in lower-cost markets in the Southeast and in Texas while developing a reduced mix of properties in high-cost markets like Southern California. The result is gross margins of 17.8% so far this year, up from 17.4% in 2017, even as the average selling price has fallen about 1%. Meritage CEO Steve Hilton has said this is because the company benefits from a number of efficiency gains when it builds fewer custom homes, and more standardization also results in higher margins. MTH EBIT (TTM) data by YCharts. While it's abundantly clear that the transition to more entry-level homes has paid off so far, it could have an impact on the predictability of Meritage's business results. One of the benefits of the starter-home strategy is that it allows the company to build and sell more standard homes, many of which it builds on spec (short for speculation) without an order in hand. The positive is improved gross margins, but the negative is that the company saw its home order backlog decline by $161 million from the second to the third quarter. It also reported a 7% decline in the value of homes ordered during the quarter. On one hand, this is actually an expected outcome, and there's a good chance that we could see further deterioration of its order backlog as first-time buyers become a bigger part of the sales mix. But if orders fall even more sharply, that could be a warning sign. Second, Meritage's investments in new land are another thing to watch closely. Like most homebuilders, Meritage is highly leveraged, typically using debt to acquire land today that it may not develop for two or even three years. The risk is that, by adding more leverage to acquire an asset that will sit on its books generating no return for multiple years, the company could hinder its ability to navigate a downturn in housing sales. In the quarter, Meritage did indeed acquire more land. It ended the third quarter with 34,400 lots, up from 33,700 at the end of the second quarter. The good news is that even though it bought more land, Meritage actually finished the third quarter with a stronger balance sheet than it started with. The debt-to-capital ratio fell from 43.8% to 43.4% sequentially, an even better year-over-year improvement from 44.9%. More evidence that management is taking smart steps: Meritage has generated $73.6 million in operating cash flows this year and has added more land and cash to its balance sheet while only increasing total debt approximately $30 million. Management also repurchased $30 million in shares last quarter at what could prove a substantial discount to fair value based on its recent earnings. Housing has softened in recent quarters, and along with rising interest rates, there are very real concerns that there could be a protracted slowdown in home sales in coming quarters. And on a big-picture perspective, that's a very realistic -- maybe probable -- reality, since housing prices have put buying a home out of reach for many, and rising rates just push it farther out of the picture. But this reality further cements why Meritage's pivot to entry-level housing in solid growth markets has paid off and should continue over the long run. After all, the biggest cause of weakness in housing has persistently been a weak supply of entry-level homes, not a lack of interest from first-time buyers. This should position Meritage well for the long term.